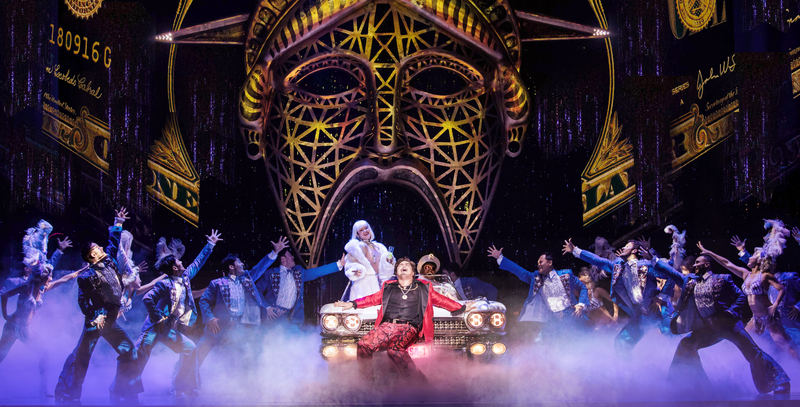 CHICAGO — Through Dec. 8, “Miss Saigon” makes a triumphant return to Chicago for a limited run at the Cadillac Palace Theatre. It’s the love story of Chris and Kim, an American G.I. and a Vietnamese woman who meet in 1975 at a brothel in Saigon during the Vietnam War. That sentence is the epitome of “Miss Saigon’s” potential problems, in a climate that is increasingly, rightfully, scrutinizing about depictions of culture and historical events (see also: “South Pacific” and “The King & I”). One starts to wonder if the song and dance show is an appropriate lexicon for talking about a complicated topic like the Vietnam War. But in “Miss Saigon’s” case, I say yes. This show is campy and uncouth when it can be, yet the staging, by the show’s original producer, Cameron Mackintosh, and director Laurence Connor, maintains a kind of respect for its subject matter that, in my view, evades the outdated, sexist colonialism plaguing those other aforementioned musicals. (And it doesn’t hurt that the cast members playing Vietnamese characters appear to be almost entirely of Asian descent). That’s not to say that “Miss Saigon” feels comfortable. Recall that the opening scene is an American soldier (Anthony Festa) meeting the love of his life (Emily Bautista) in a whorehouse, a woman who was forced into the profession, against her will, by the creepiest of pimps, played by Red Concepción. The plot is necessarily dark, and ends abruptly and tragically, letting audience members understand that there is little to no resolution to the human cost and emotional collateral damages of that terrible war. In that sense, “Miss Saigon” shares much in common with “Les Miserables,” although the similarities are deeper than their grim subject matter and not-so-happy endings (“Les Mis,” for those who aren’t in the know, is about the French Revolution). Thanks in large part to a book, lyrics and music by the team of Alain Boublil and Claude-Michel Schönberg, there’re equally rich sonic landscapes in both musicals. The orchestra and artists onstage are uniquely challenged by Schönberg, such that there’s a bit of crossover between the cast of “Saigon” and last year’s revival of “Les Mis” — most notably Bautista, who played Eponine in the North American touring company. The point is, if you love the music of one, you’re likely to respond positively to the other upon first listening to it, as I did on Thanksgiving Eve. 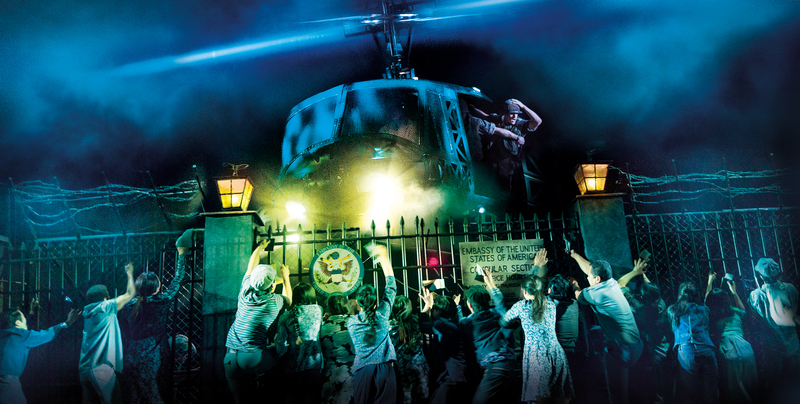 While the show has undergone a few updates since its last visit to Chicago in 2000, that which stunned “Miss Saigon” audiences at the Chicago debut a quarter-century ago still impresses, namely, a two-ton helicopter suspended above the stage in the Act II flashback scene of Chris’ departure from the U.S. Embassy during the fall of Saigon. It’s a scene which perfectly marries technical theater and smart staging, an analog feat of magic and the piece de resistance of the musical. Imagined today, the scene might be entirely dependent on projections and other digital technologies, but it’s not just about that helicopter. As the fences of the Embassy rotate, the audience sees the perspective of the Americans and Vietnamese, both. For me, this scene illustrates the lose-lose situation of war, the pain and desperation imposed by what many viewed as a purposeless stain in our history. “Miss Saigon,” to me, lays that out without taking sides, when each and every day presents more impossible problems for which there are no good solutions.